When you need a break from the hustle and bustle of the holiday season, why not plan a trip to one of Newport, Rhode Island's historic mansions? Gorgeous at any time of the year, these historic vacation retreats of the turn-of-the-20th-century American aristocracy are simply spectacular when dressed in Christmas finery and glowing with candlelight. You're sure to forget all about the gifts still to be bought and wrapped, the cookies to be baked and all of your holiday chores when you visit one of the decorated mansions this holiday season. Here are some highlights to start you dreaming of the elegance and extravagance of Christmases past and to help you plan your respite from modern holiday stress. At Christmastime especially, it is hard to believe Newport's seaside mansions were mere summer cottages for their wealthy owners. Even the term "mansion" doesn't quite do justice to these American palaces overlooking the Cliff Walk and the Atlantic Ocean. Built in the 19th century by captains of industry and finance, these splendid homes really were only occupied for a few fair-weather months of the year. The Preservation Society of Newport County operates 11 properties—seven of which are National Historic Landmarks—but only a handful are dressed for the holiday season each year. Even still, Newport is New England's best destination for historic home tours each holiday season. And, without summer's restaurant lines and crowded beaches, Newport is perhaps an even more charming and peaceful getaway this time of year. If you can't get your fill of glamorous holiday homes in Newport, you can see more mansions aglow in New York's Hudson Valley this Christmas season. Three of the Preservation Society of Newport County mansions officially open for the holiday season on November 17, 2018. The Breakers, The Elms and Marble House will be decorated and open daily through January 1, 2019. Hours are 9 a.m. until 5 p.m. at The Breakers; Marble House and The Elms open at 10 a.m. Plan to arrive before 4 p.m., when the final tour begins at each property. The houses are closed Thanksgiving Day and Christmas Day. On Christmas Eve, the 3 p.m. tour will be the last tour of the day at all three mansions. New for 2018, the Preservation Society's Rosecliff will also be open daily from 9 a.m. until 5 p.m. from December 2 through January 1. Special Winter Passport tickets are available at any one of the houses, or they can be purchased online. This combination ticket for admission to all four houses is $30 for adults and $10 for children ages 6 to 17. Children under 6 are admitted free. Purchased separately, admission to The Breakers is $24 for adults, $8 for children 6-17. Tickets to view Marble House, The Elms or Rosecliff are $17.50 for adults and $8 for children 6-17. Call 401-847-1000 for more information. 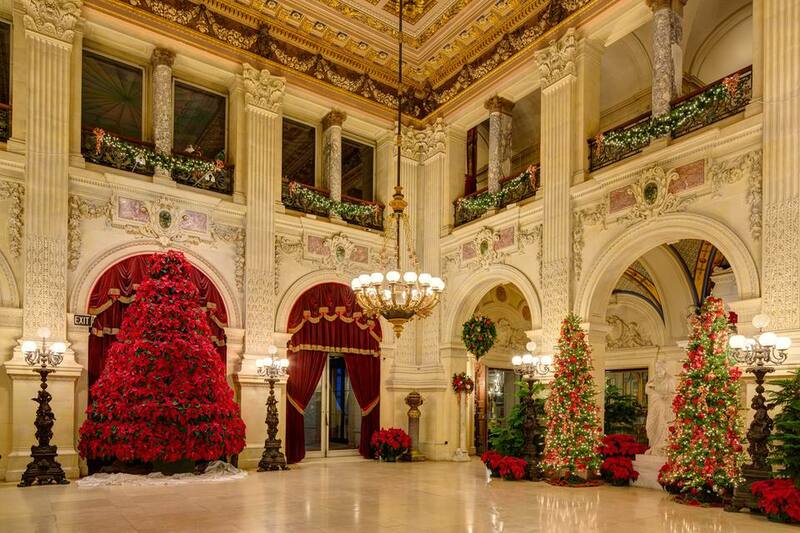 For an extra special treat, plan to visit Newport's mansions during one of five special "Holiday Evenings at The Breakers" featuring live holiday music and elegant refreshments. These "Holiday Evenings" are slated for Saturdays, November 24 and December 1, 8, 22 and 29, from 6 to 8 p.m. each evening. Tickets are $35 in advance or $45 at the door (if tickets remain) for adults and $10 for children ages 6 to 17 in advance or $15 at the door. There will also be a Holiday Evening Duet event at The Elms and Marble House on Saturday, December 15, from 6 to 9 p.m., when guests can see two houses for the price of one and enjoy musical performances. Other special Christmas events planned at these four historic homes include visits from Santa Claus and a Holiday Dinner Dance at The Breakers. There will also be Nutcracker ballet performances at Rosecliff this holiday season. There are many more Christmas in Newport events to add magic to your late November or December getaway. Need help finding a place to stay? Newport County Inns and Bed & Breakfasts Association is a tremendous resource for selecting one of the many cozy inns or hospitable bed and breakfast lodgings, such as the Marshall Slocum Inn or Cliffside Inn, from a wide array—most available at off-season rates! Inns of Newport operates four classic Newport inns that are all listed on the National Register of Historic Places. The Chanler, a luxurious mansion turned inn, is an uber-romantic holiday season hideaway. Or, Discover Newport provides information about a wide variety of Newport Getaway Packages.